It has been almost 15 years since I got drunk at the races on Melbourne Cup day, walked home carrying my shoes, stopped for a swing in the local park and fell off the swing only to land on top of my hat. It was in that moment that I discovered that drunken, shoeless ladies are not really ladies. These days, I keep my shoes on, my hat on and my dignity intact. I now live a short walk from both of Brisbane’s racecourses and most Saturday afternoons I find myself having to negotiate my way past revellers (some of who are a little worse for wear) as they leave the track headed for home or the Hammo. As you can imagine, I’ve seen some sights; after this year’s Ekka Day Races, I can also say I’ve seen some more lady parts (I’m sensing this is becoming a theme). Please, for the love of God, PULL YOUR DRESS DOWN! With the Spring Racing Carnival just weeks away, I have already found a floral dress for Melbourne Cup day and I’ll be topping it off (literally) with a stunning fascinator from milliner Amy Zischke of Pink Lane Hats. I adore Amy’s creations, having worn a custom-made piece to this year’s Stradbroke Cup so when it came time to find a piece for Melbourne Cup day, Amy was my first—and only—port of call. I’m always fascinated (pun intended) to find out how people start their own businesses so I recently caught up with Amy for a quick Q&A and discovered her talent was inherited from her grandmother. Q. What drew you to become a milliner? A. My grandma was a milliner, so it has been a big part of my female family bonding for my whole life. I think it was a natural path for me to fall into and it has always been a topic of discussion in my family around me. Yes, I have always loved hats! Q. When did you start making hats? A. I started learning the fundamentals (blocking) at around 16 years old. Gradually over the years I learnt more and more from Grandma until I left home and got married. Then, after having children, I started a business from home, launched a website and it has just grown ever since. I still regularly attend classes to learn the modern and on-trend techniques. Q. How has your design style changed throughout your collections? A. I think my designs change according to each year’s fashion trends, and also as new millinery materials emerge. Many of my designs are based on the materials I find. Q. How long does it take to design and make each fascinator? A. It does depend on the fascinator; a small fascinator on a headband can take me an hour, whereas a lot of my more involved pieces (especially the ones made from leather) can take up to three days. Q. What process is involved in making fascinators? A. My process starts with finding the best materials I can for each client. Then I mould (block) the fabric over the correct shape, steam it, stiffen it, wire it, wire its trims, then I play around with the design until I get it right. and stitch it all into place, stitch in a band and voila! Q. 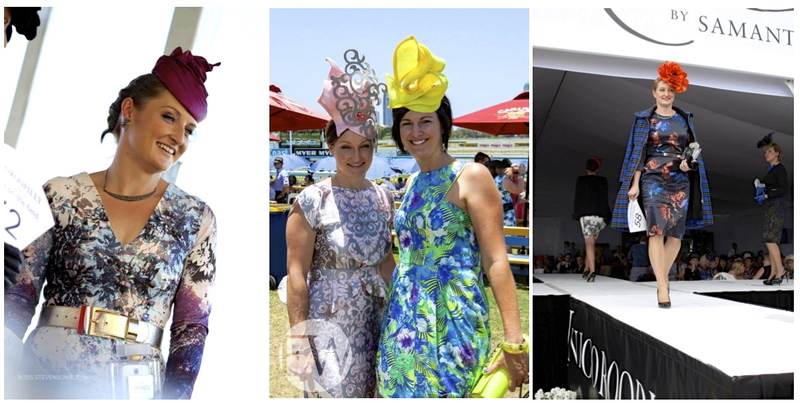 What are your tips for headwear during the Spring Racing Carnival and coordinating it with outfits? A. Find something to complement your outfit; it doesn’t necessarily have to be an exact match to the dress colour and make sure you give it some thought in advance—when you give yourself plenty of time to put it all together, you will generally be happier with the end result! What do you love about the races? A. I love the socialising of the day, seeing people you haven’t seen in a while and catching up. I love the thrill of the horses running the final straight, and of course, I absolutely love checking out what everyone is wearing! Q. How do you choose your outfits for race days? A. I like to find something a bit different that I haven’t seen before and that possibly I won’t see being worn by anyone else on the day! I do sometimes have items custom-made for me. I am an online shopping addict and love browsing all my favourite online stores and designers on a regular basis. I usually start with the dress first, but sometimes I have started with a clutch and kept going from there. Q. What’s the biggest headwear no-no you’ve seen at the track? A. Women wearing their fascinator too far back on the head; wear them forward onto the forehead! Also, wear light sinnamay and straws in Spring, felts and heavy material hats for winter generally (unless you’re in Victoria). Q. I was once told that ‘you need to wear the hat, don’t let the hat wear you’. Do you agree? A. Yes totally! As you can see from my designs, I like to keep them simple and yet as original as possible. Sometimes less can be more. Wear a hat style that suits you and your personality and you can’t go wrong. Raceday perfection from top to toe. To check out Amy’s stunning range of fascinators, visit her website here.